They say that the definition of insanity is doing the same things over and over again and expecting different results. If you do the same things over and over again in the stock market, you are guaranteed to get very different results. Do you know why? Because the market is constantly changing. This is the big secret of financial markets. Nothing works all the time. Different setups work in different markets. Everyone makes money in a bull market. Not everyone keeps it when the market goes into correction or a range-bound, choppy mode. A good trader is able to adapt to changing markets. Some say that discipline and risk management are the solutions to all trading challenges, but they are not going to help you if you trade a setup without an edge in the current market. Discipline + A losing setup = Consistent losses and frustration. The one big thing that can improve your trading life is learning how to recognize changes in markets and being able to quickly adapt to them. Different setups work in different markets. Knowing what works and what doesn’t work in each environment is 80% of the battle. There are four major types of markets and each of them requires a different method: Uptrend, Range-bound, Downtrend, and Bottoming Process. On these pages, I share my approach to each of them. 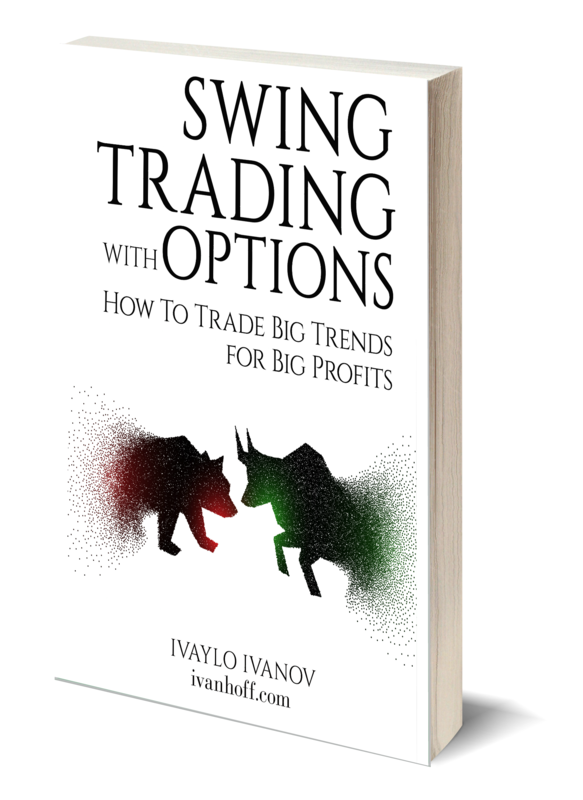 In this book and in my personal trading, I focus on setups that have at least two of the above-mentioned catalysts going for them. This is one of the most practical trading books ever written. It doesn’t waste your time with personal stories of grandeur. It is all about setups. 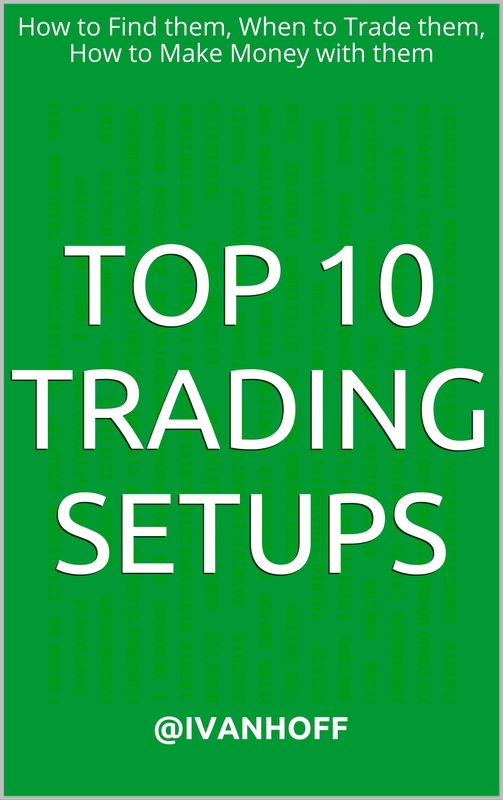 I explain what setups to trade and when, why they work, how to find them, how to trade them, where to exit. It is a complete game plan for any market environment. 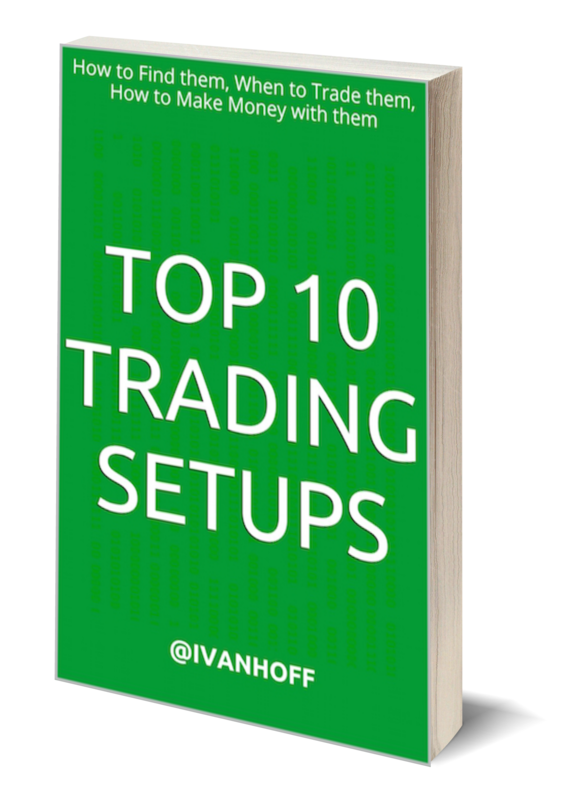 And since I believe a good picture is worth a thousand words, there are 140 annotated charts with examples for the ten major setups discussed in the book. INTRODUCTION – The one thing that will make you a better trader. Chapter 1. BREAKOUT SETUPS – How to profit from range expansion. Chapter 2. PULLBACK SETUPS – How to enter an established trend with low risk and for high reward. Chapter 3. IPO SETUPS – How to find stocks that can go up 50% in a month. Chapter 4. INDUSTRY MOMENTUM SETUPS – How to benefit from one of the most powerful market forces. Chapter 5. EARNINGS GAP SETUPS – How to profit from post-earnings-announcement drift. Chapter 6. SHORT SQUEEZE SETUPS – How high short interest might lead to explosive short-term moves. Chapter 7. HUGE VOLUME SETUPS – How to quickly grow a small account. Chapter 8. 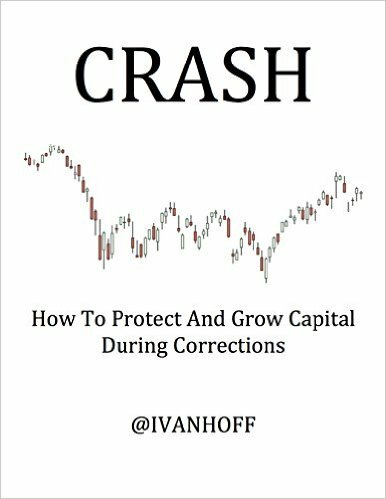 BEARISH SETUPS – How to make money during corrections. Chapter 9. RELATIVE STRENGTH SETUPS – How to gain from the moves of big players. Chapter 10. MEAN-REVERSION SETUPS – When is the right time to go against a trend? The odds of an investor experiencing a big market crash during his/her life are 100%. A well-diversified portfolio will save you from losing money in any 10-year period, but it also “save” you from achieving high returns over time. Diversification won’t save you from experiencing big drawdowns during market panics when correlations go to 1.00 and all assets move together up and down disregarding of underlying fundamentals. Paul Tudor Jones says that “once in a hundred years events” have started to occur every five years. Obviously, his comment is more of an anecdote than a statistical fact, but it is also a reflection of a timeless market truth – the obvious rarely happens, the unexpected constantly occurs. The stock market is not a place, where for one party to win, another has to lose. It is a place, driven by cycles – periods when almost everyone is a winner followed by periods when almost everyone is a loser. Everyone could make a lot of money during market rallies when liquidity and performance chasing lift all boats and trump all bad news. Not everyone keeps that money when the inevitable correction comes. They say that the definition of insanity is doing the same thing over and over again and expecting different results. Well, if you do the same things over and over in financial markets, you are guaranteed to get different results. Markets change; luckily in a relatively cyclical manner; unluckily the duration of each cycle is unpredictable. Patterns repeat all the time because human mindset hasn’t changed for thousands of years. Since 1980, the S & P 500 has had an average intra-year decline of 14.2%. In 27 of last 35 years, stocks have still been positive for the year. Corrections come a lot slower than anyone expects, but once they happen they escalate faster than most could imagine. All corrections feel the same. At the beginning, people don’t believe them, then as prices continue lower and weakness spreads to more sectors, fear escalates and it leads to forced liquidation. Forced liquidation means selling, because you have to, not because you want to. Smart investors dream to be on the other side of forced liquidation. It is easier said than done, but there’s method to the madness. Each correction is preceded by distribution and weakening market breadth. Stocks top individually but tend to bottom as a group. At the lowest point of a correction, the fear of losing is substantially higher than the fear of missing out. 1) Quick and wide-spread leg lower that ends with a momentum low. 3) Choppy period, that whipsaws both bulls and bears. 4) A Retest of the momentum lows with breadth divergence. The history of U.S. stock markets has been a perpetual long-term uptrend interrupted occasionally, but very consistently by shocks. Most of those shocks take the form of short-term drawdowns that come and go. Some corrections turn into bear markets that last more than a year. They say that almost everyone loses money in bear markets – both bulls and bears. Bulls because they stubbornly hold on to positions in favorite companies and some stocks never recover from deep drawdowns. Bears because they get squeezed during the violent rallies that happen under declining 200-day moving averages. Bear markets should be respected, but they should not be feared. They require a different approach than what most are get used to in bull markets. I wrote this book mainly to serve as my own guidance, to organize my thoughts and learn more in the process. Keep in mind that everyone has his own agenda and bias, including me. The following pages present the perspective of a trader, who believes in active portfolio management and stock picking. The thought process and observations that I share here might not be suitable for everyone. • Only 71 companies from the original 1955 Fortune 500 list remain today. • Some of the biggest stock market winners of the new millennium were either near bankruptcy, small private companies or young IPOs 15 years ago. In other words, no one could predict how successful these companies would become, including the founders. • None of the established big names from the 1990s turned out to be among the best performers in the 21st century. • Some of the best-performing stocks of the ‘80s and the ‘90s are bankrupt today or have been terrible investments in the new millennium. In 2015, the world is more interconnected and changes faster than at any time in history. We live in an era where technology and society are evolving quicker than the ability of many organizations to adopt. Many simply cannot keep up with the pace of innovation, or after they reach a certain size, they become too complacent and stop growing. Wall Street has never been a great forecaster, and the global, social, mobile world has only made forecasting and analyzing more difficult. There are no sure things in the stock market. Nothing is promised or guaranteed to anyone. Yet every decade like clockwork, the stock market has delivered hundreds of stocks that go up 1000% or more. Even better, the best performing stocks have consistently shared similar characteristics. The more the world changes, the more things stay the same. Patterns repeat in the financial markets. Only the names of the winning stocks change. In the bull market run of the ‘90s, everyone won. Things turned upside-down after 2000. The first 10 years of the 21st century were not kind to the average investor. Some even ventured to call them the lost decade. The market survived several “once in a hundred years” crashes – in technology, housing and finance, yet at the end, most market averages recovered and made new all-time highs. It took 13 years for the S & P 500 to substantially surpass its highs from the dot-com boom. If you invested a dollar in the S & P 500 in early 2000, you would have had a dollar by early 2013 – a dollar that would be worth a lot less at the time because of the diminishing impact of inflation on purchasing power. The S & P 500 basically delivered no returns for 13 years, but under the surface, there were huge winners among individual stocks. Fortunes were made and lost. Ten-thousand dollars invested in Apple in 2003 is worth about $1.5 million in 2015. Despite two of the scariest recessions in financial history and enormous market volatility in the first 15 years of the millennium, the stock market provided the opportunity to invest in hundreds of stocks that went up 1000% or more. The market is an opportunity machine. Some trends last only several quarters before they fade, while others continue for years and deliver fantastic returns. Sooner or later, though, every trend ends. This is not an opinion. It is a fact. Knowing when to sell is just as important as knowing what and when to buy. 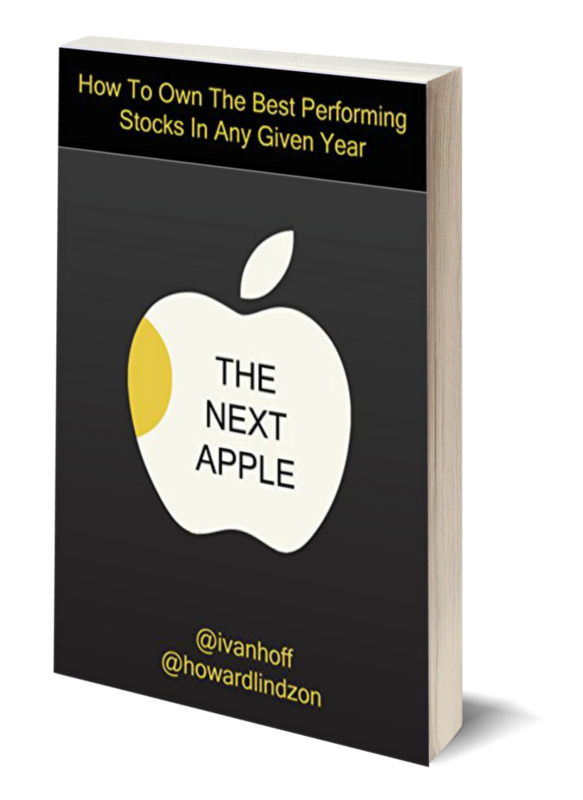 This is not a book about the company Apple or its stock. This is a book about finding the next Apple or at least hundreds of “mini-Apples.” The next Apple could and should change your life. The good news is that over the next 10 years – in any 10-year period – there will be multiple stocks that will advance a 1000% or more. 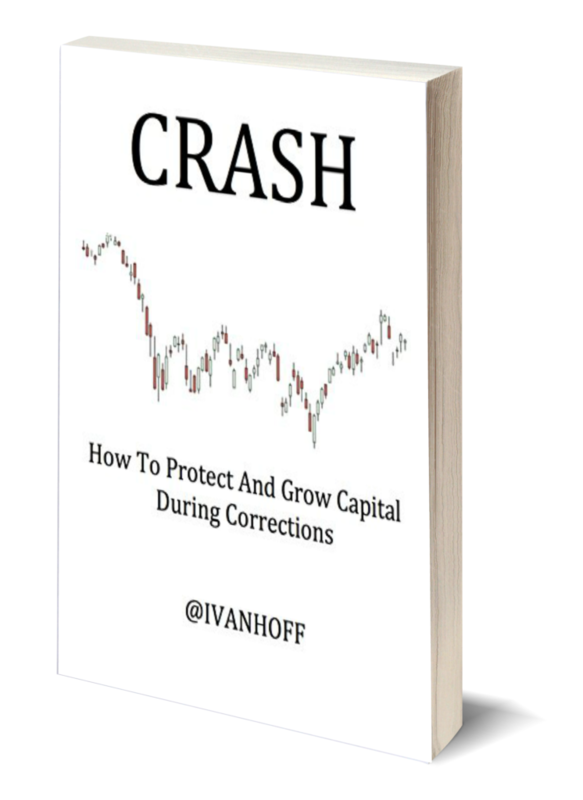 The principles in this book will improve your odds of finding those stocks and, more importantly, riding them until it makes a difference in your returns. The quality of our lives depends on the decisions we make every day. It’s not a secret that the best return you will ever get is by investing in your own business. Not everyone has a brilliant idea and, more importantly, the means, the skills or the desire to build a great business. Let’s get real – how many could actually create the next Facebook, Apple, Under Armour or Tesla? Warren Buffett says that he prefers to own part of a wonderful company than 100% of a so-so business. Everyone could invest in companies with great potential and participate in their growth. The stock market gives you that opportunity, but you also have to learn how to play the game. You have to learn how to speak its language. If your goal is to achieve average market returns, just consistently put money into low-cost indexes and get it over with. If you are going to spend time, effort and money on learning how to invest, make sure it’s worth it. The only reason to actively pick stocks is to achieve returns that will make a real dent in your universe. When you are done with this book, you will know everything you need to know in order to find and profit from the next Apple, Starbucks and Tesla of the world. You will be a smarter and more knowledgeable investor. 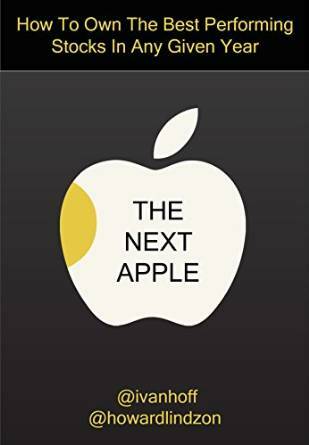 • Can you find the next Apple, Google or Tesla? • Do what you love and success will follow is the most frequently given advice. Is “Invest in what you love/know” an equally bright idea? • Does past performance impact future returns? The answer might surprise you. • How to find the best performing stocks in any given year? It’s a little counter-intuitive, but if you do what everyone else does, you cannot expect to achieve superior results. • George Soros says that sometimes the market could predict its own future. Is the market always correct, and more importantly, how does that affect you as an investor? • Timing is everything in investing. When is the absolute best time to buy, and which stocks should you buy? • Some trends last only several quarters before they fade while others continue for years and deliver fantastic returns. Sooner or later, every trend ends. This is not an opinion. It is a fact. How do you make sure you keep your profits when a trend inevitably ends? • Why don’t you need to know the future in order to consistently make money in the stock market? The only question that will remain is whether you will put that knowledge to work and create a better life for you and your closest people. 1) Hunt for several huge winners in a year. Build large positions in them and ride them for monstrous gains. 2) Hunt for hundreds of 5% to 30% short-term winners, where the goal is to compound capital quickly by actively moving in and out of them. There is not right or wrong approach here. Both have place in the arsenal of each active market participant. Everything comes at a price. If you want to catch a 200% to 300% long-term winner, you have to be willing to sit through multiple consolidations and several bigger than 30% pullbacks. Not everyone has the stomach to ride big stock market gainers, but maybe you don’t have to. If you sell all your winners, when they are up 20%, you will never catch a double or a triple. Fact. What is also true is that in any given year, there are a lot more 20% moves than 100% moves. If you learn how to catch hundreds of quick 5% to 20% moves, your capital could appreciate very quickly while you keep you keep the drawdown in your account to a minimum. 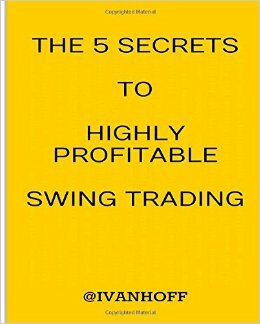 Swing trading is among the fastest way to grow capital if you learn how to properly apply its principles. Swing trading is all about velocity and opportunity cost of capital. The goal is to stay in stocks that are moving quickly in our favor and avoid “dead money” periods. Stocks move in 5% to 30% momentum bursts that last between 2 and 10 days, before they mean-revert or go into sideways consolidation. The goal of every swing trader is to capture a portion of a short-term momentum burst, while avoiding consolidation periods. Then to repeat the same process hundreds of times in the year by risking between 0.5% and 1% of capital per idea. The beauty of swing trading is that it provides many signals. You don’t need to risk a lot per signal. You won’t second-guess yourself whether to take a signal or not. One trade is not going to make your year or your month, but it also won’t ruin it. It relies on the magic of compounding. The idea is to grow capital quickly by being leveraged to the hill during favorable periods and being mostly in cash during unfavorable periods. I know that if you apply the principles I describe in this book, you will become more knowledgeable, more profitable and happier market participant. 1) What drives short-term market moves? 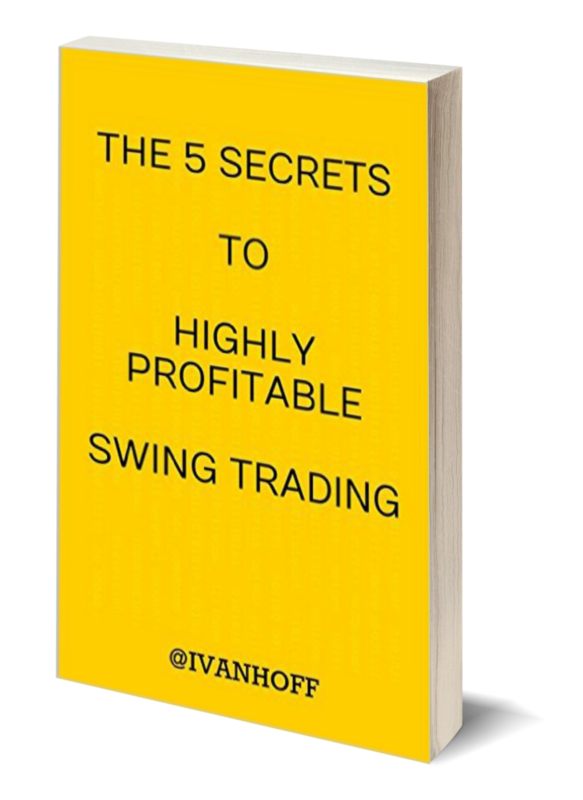 How to recognize perfect swing setups; when to buy them and where to put your stop losses. 2) When to sell and how. 3) How to be more profitable. How to improve your success rate and where to hunt for big short-term gainers. 4) How to manage risk properly. How to decide how many shares you should buy of every stock you like. How to check if you have an edge in the market. 5) How and why to time your market exposure. 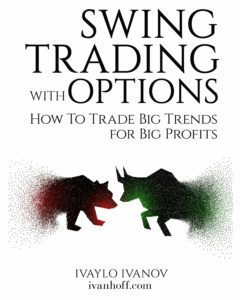 This is a really good book on swing trading. Check it out on Amazon.